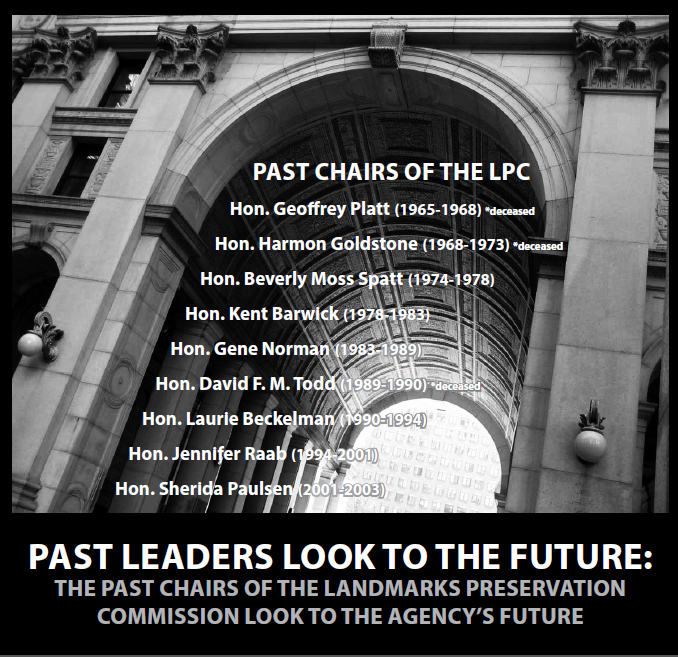 Two months ago, the New York Preservation Archive Project (NYPAP – whose Board I have just joined) convinced four of the surviving past chairs of the New York Landmarks Commission to sit together on a panel. Beverly Moss Spatt, Laurie Beckelman, Sherida Paulsen and Kent Barwick together discussed the past and the future of historic preservation in New York (Gene Norman and Jennifer Raab were unable to attend). The underlying issue, of course, was the prospect of a new mayor (thanks to the upcoming election later this year) bringing in a new Landmarks chair to replace Bob Tierney, who currently holds the record for longest tenure in the job – ten years. A Youtube video of the panel has just been posted, and it makes for very interesting viewing. Beverly Spatt’s remarks were remarkable for their candor and insight into the workings of preservation in city government. Laurie Beckelman pointed out that while past commissioners had been unable to do much in the financial district, her successor, Jennifer Raab, did quite a lot, because she had the support of Mayor Giuliani – making clear how important the support of the mayor can be to the Commission’s success. Sherida Paulsen noted that the number of designated buildings over the past 10 years, during Bob Tierney’s tenure, has grown from 23,000 to 31,000 – an enormous increase. Kent Barwick lauded Beverly Spatt’s creation of a formal survey of the city, focussed on landmarks beyond the confines of Manhattan Island, and recounted the competition with the Planning Department in dealing with land-use issues in the city. Several of the chairs talked about past threats to subsume Landmarks into other, larger city agencies.Laurie Beckelman confessed that she had “made friends” with DGS Commissioner Ken Knuckles, who in turn made it possible for LPC to move into its own building at 100 Old Slip – on the theory that in its own building LPC would be more difficult for some other agency to digest. If you couldn’t attend the panel, you’ll find this video well worth your while.